Sitting down and making a family budget may not be the most fun activity you ever do. However, the effort and thought you put into your budget can help relieve stress and enable you to manage your money more efficiently. 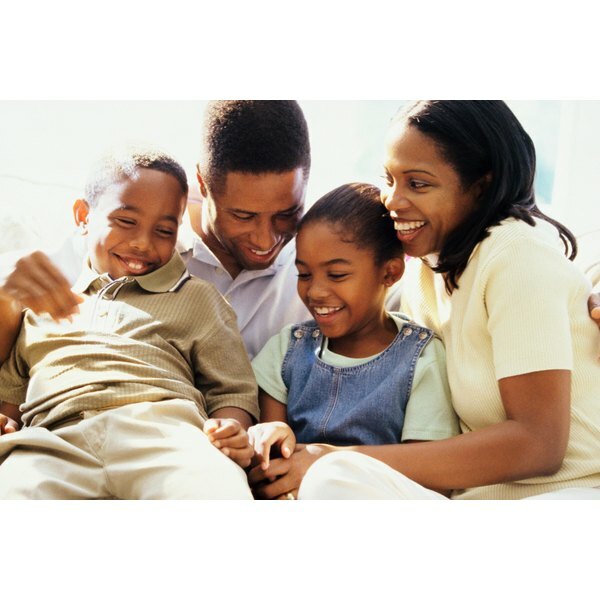 Learning to budget for your family of four is the first step toward smart financial management. If you have attempted family budgeting before but have experienced difficulty staying on track, try once more to set your family on the right financial path. List your fixed monthly expenses. Include mortgage or rent payments, electricity, cable, food, phone, insurance, loan payments and transportation costs. If your children are in child care or a private school, add those costs as well. To ensure accuracy, use past bank statements to make a complete list. Look through your past 12 months of expenses. Write down any expenses that are paid annually. Magazine subscriptions, pest control fees, car registration fees, membership dues and school supplies for your children are such expenses. Add these together and divide by 12 to obtain the average monthly cost of these annual fixed expenses. List this result on your monthly budget sheet. Write down your variable monthly expenses on your sheet. List the cost of clothing, entertainment, restaurant meals and other variable expenses for both adults and children. Remember to look over the past year and include expenses that do not occur every month, such as school lab fees, sports or music lessons, and the purchasing of gifts. Compare the total of your monthly expenses to your monthly take-home income. Note whether your expenses are greater or less than your income. Examine each budgeted category and decide if you need to reduce that expense. Involve your children in the discussion if they are old enough. Rewrite your monthly budget with your adjusted figures. Prepare for unexpected expenses by setting up an automatic transfer system with your bank to establish or build a savings account. Budgeting your savings into your monthly budget helps establish the habit of saving money. Encourage your children to save part of any money that they receive. Decide whether you or your partner will be responsible for keeping track of your monthly budget. Allocate whose income covers which expenses if you are a two-income family. Rotate the responsibilities occasionally to ensure that both of you understand where your income is spent and how much you save each month. Commit to open, frequent communication. Set up an envelope system to break any credit card habit you may have. Commit to paying cash for as many expenses as possible. Pay your fixed expenses before calculating how much money you have left for variable expenses. Put the budgeted amount of cash in an envelope designated for each variable category expense, such as entertainment, clothes, restaurant meals, coffee and gifts. Once the money in that envelope is gone, do not make any additional purchases for the month in that category. Use budgeting software to streamline the process. Consider automating loan payments through your financial institution. Stop using credit cards and pay off any outstanding balances. Establish savings accounts for your children. Open a vacation or holiday fund to help save for those expenses. Consult with a trusted friend or adviser concerning any financial difficulties. Beware of consolidation loans if you have credit card debt. Analyze any fees and expenses associated with savings plans.